The problem with making a full batch of cookies is that you then have rather a lot of cookies to eat (8 dozen ginger snaps, anyone?). Of course, your coworkers and friends likely appreciate fresh cookies, but sometimes they’re dieting or you don’t have any social events but you still want a cookie. The solution: refrigerator (or icebox) cookies! You make the dough, roll it into a log, wrap it in waxed paper, add a layer of foil, and pop it into the freezer. (If you only very occasionally feel the need for a cookie, I would place the log in a freezer bag as well.) Get a yen for a cookie? Pull it out, slice off a few rounds and bake. Voila! Fresh cookies for one. Classic cookbooks like Fannie Farmer or the Joy of Cooking all feature icebox cookies. My favorite icebox cookies growing up were a simple lemon cookie. If you want something trendier, try using the dough for 101 Cookbook’s Buckwheat cookies as refrigerator cookies. Cooking for one is oddly challenging for many of us. 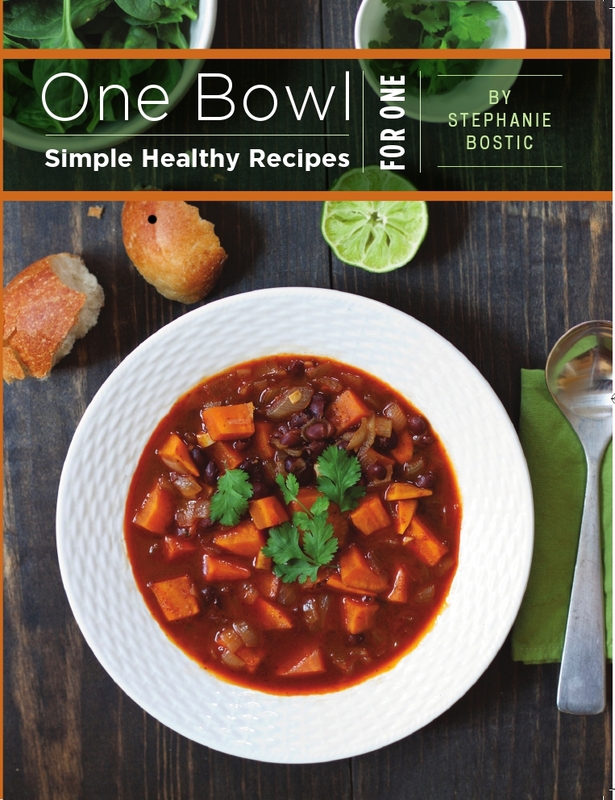 Learn new tips, and create delicious easy meals by using the recipes in One Bowl. In addition to great recipes and basic cooking techniques, it also features a brief intro to nutrition with suggestions and worksheets to help the reader eat more fruits and vegetables. A perfect gift for your grandmother, friends, or anyone headed off to college or their first apartment, One Bowl will quickly become essential to any small kitchen. Available in hardcopy or Kindle on Amazon, and retailers nationwide upon request (ISBN: 146369072X). Signed copies may be ordered from the author using the link at the top of this page. International readers can request it from their usual bookseller.